The Café Racer phenomenon has come back in full force over the last couple of years. Café Racers started in 1960’s Britain, and was characterized by a counter culture of Rockabilly types. Two groups specifically made up this crowd, the Rockers and the Ton-Up Boys. The name Ton-Up was derived from the goal of reaching speeds of 100 mph, slow in today’s motorcycle world, but a lofty goal in the 1960’s. The term Café Racer came from the intended use of these motorcycles, which was the travel quickly between roadside cafes on newly constructed roads in British locales. Record Racing was a big part of the Café Racer sub-culture. Record racing took place at a Café, of course, when two racers would race to a decided location and return, in the time it took to play a single song on the Café’s juke box. A decidedly dangerous, but exciting pastime for the youth of the day. The cool factor of Café Racing has returned in a big way in the early twenty first century. There are numerous clubs, television shows and websites popping up espousing the way of the Café Racer. Certain motorcycles have taken form as the preferred bikes with which to make a café style motorcycle. One of the most popular is the Honda CB550. The Honda CB550 is powered by a 544cc single overhead cam four cylinder engine. The motor is air cooled with a number of fins on the head and block to channel air flow. It was built between 1974 and 1978 and is the little brother to the Honda CB500. The CB550 was offered in two models, the CB550K and CB550F (Super Sport). The F and the K versions were sold simultaneously and were very similar from a mechanical perspective. Their looks did differ slightly however, the F models sported a sportier looking 4 into 1 exhaust, and a more muted chrome package. The side covers were a bit sleeker and the handlebars were pitched every so slightly lower than those on the K model. Both had the same gas tank design and frame. The CB550K was released in four iterations, denoted by the suffix 1 – 4 after the “K,” the last being the CB550K4 in 1978. This bike was characterized by its 4 into 4 metallic exhaust system, with two exhaust pipes protruding on each side of this iconic bike. The K model featured a front disk brake, which was state of the art at this time, and a drum rear brake. The CB550F was also released in a similar fashion, F1 through F4. As previously mentioned, it came standard with a factory installed 4 into 1 exhaust system which provided a bit of a throatier sound and a relatively unnoticeable power bump. Aside from the exhaust, it would be difficult for a novice to distinguish between the two. The CB550 family was tested at 50 brake horsepower at 8500 rpm, and was able to achieve speeds of up to 100 mph. 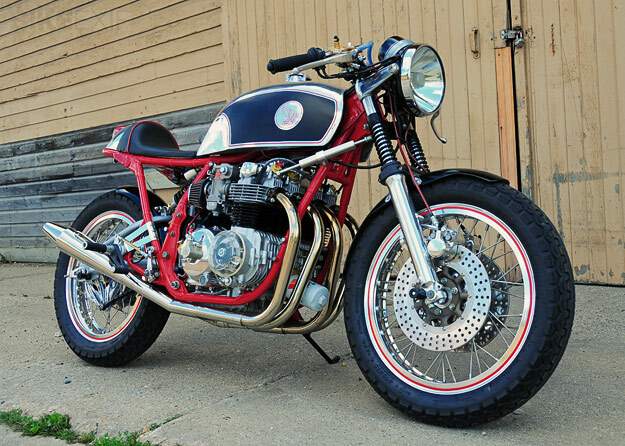 In terms of Café Racer Motorcycles, the CB550 has been a fan favorite. There are a few reasons for this; first, it is a highly capable machine for its age, second, they can be sourced easily for under $1,000, and third, there is a treasure trove of aftermarket parts available for these bikes that makes the modification from stock CB550 to CB550 Café Racer very easy to achieve. Even a novice can convert one of these to a café look with the simple addition of Clubman Bars ($25) and a new seat (new seat optional).